Note: This product is a subscription-based product. Charges will be incurred automatically unless you change the setting in your profile. Refunds will not be provided for any charges incurred unless it is due to issues that occur on our side. 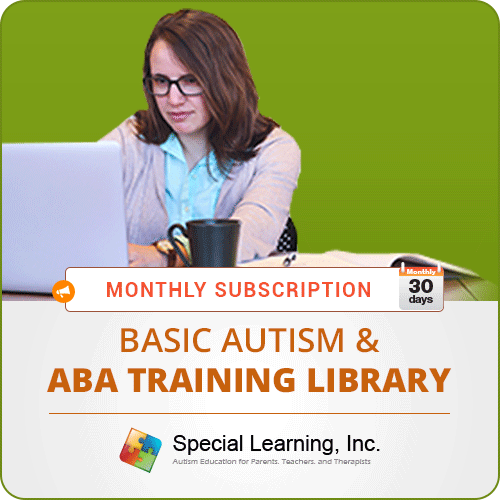 Special Learning's Basic Autism and ABA Training Library Monthly Subscription gives you monthly access to the 9 individual training webcasts from our Level 1 ABA Online Training Course. The library format provides the flexibility to view any webcast topic in any order without having to complete the pre, post and final exams such as in the Level 1 ABA Online Training Course. Note: This product does not entitle the purchaser to any certificate of completion. This product is not downloadable.